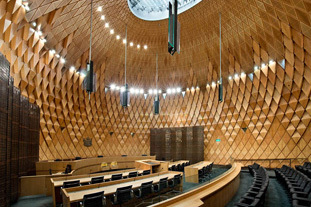 The design of the elliptical courtroom within the new Supreme Court reflects a strong New Zealand influence – the distinctive domed atrium references the cone of the native kauri. But the project was not just about visual links. It was also essential that New Zealand suppliers and sustainably produced materials were used wherever possible. Lindsay & Dixon was contracted to supply maple beech timber and veneers for the interior of the courtroom and other joinery. The company also had to provide a guarantee that the timber supply was third party certified and compliant with NZ Greenbuild Council guidelines.